We all have relationships—no one lives in a vacuum—and each of us also has a relationship with the Supreme Person, Krishna. Our basic relationship with Krishna is that of parts to the whole: God is great; we're small. He's like the sun, the ocean, or fire; we're like the sun's rays, drops of the ocean, or sparks of the fire. Ultimately, God is the source of our existence, and we're all parts of His energy. As such, we all have an inseparable relationship with Him. How we relate with Him is up to us. Most people in this material world are trying to forget God entirely. The Prema-vivarta and other Vedic writings say that we've come here in the first place because we want to forget God, or Krishna, and He allows us to do that. He doesn't interfere with our free will. He keeps Himself out of sight, maintains us at a distance, and provides all our necessities of life while patiently waiting for us to turn towards Him again. begrudging and resentful—we may believe in God but not necessarily like Him. selfish—we're always asking what God can do for us. competitive—we may overtly or covertly wish we were God and hate the fact that He is. apathetic—we may not care about God one way or the other. None of these indirect relationships give us any real peace or happiness. Sooner or later, however, we become aware of a nagging sense of incompleteness in our lives. We sense we're missing something, and we are, but we don't know what it is. Our eternal relationship with Krishna is the foundation of our very existence, and once we turn away from Him we try anything to fill the infinite void left by His absence—except seek His company. We occupy ourselves with all manner of temporary relationships, material goods, obsessions and addictions, all of which ultimately leave us dissatisfied. When our dissatisfaction finally becomes unbearable, and we've exhausted all other options, we turn to the Supreme for answers to why we're feeling empty. Krishna then arranges for us to meet His devotees, and from them we can relearn who we are and how to reestablish our lost connection with our source. We each have a direct, unique, permanent relationship with Krishna. This relationship, or rasa is now dormant but can be reawakened. Hearing and speaking about Him helps us remember who we are, who He is, and what our relationship with Him is. This process of hearing, speaking, and remembering can be carried out in any genuine spiritual tradition, and is generally known as devotional service to God, or bhakti-yoga. The happiness available through acting in these relationships—rasas—with Krishna is said to give the self an overwhelming degree of pleasure. As with any relationship, our natural spiritual relationship with Krishna revives to the extent we put energy into it. The more we work towards reviving our innate love for Krishna, the more we feel extraordinary happiness, beyond what's available in any temporary, material relationship. - we can realize our true capacity for love when we develop our relationship with God. - how the Supreme Being is supremely social, how He constantly reciprocates love with His devotees, and how spiritual relationships are far more interesting and satisfying than the temporary, material variety. - the Vedic science of rasas (relationships) reveals to us the many ways of loving Krishna. 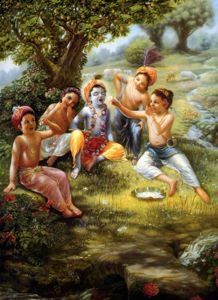 - Krishna is the Supreme Social Being; that's where we get our desire to enjoy varieties of relationships. "The one Supreme Personality of Godhead is eternally engaged in many, many transcendental forms in relationships with His unalloyed devotees." "Great devotees see Krishna as the reservoir of all relationships. . .all of them are present in Krishna. It is said that He is the ocean of all the relationships exchanged between two living entities, between the gods, or between the Supreme Lord and His devotees." "The natural position of the living entity is to serve the Lord in a transcendental loving attitude. When the living entity wants to become Krishna Himself or imitate Krishna, he falls down into the material world." —for a discussion of this verse, see Srimad-Bhagavatam, 4.28.53, Purport. "Everyone within the creation of the Lord is rendering service to the Lord indirectly or directly. No one is an exception to this law of the Lord. Those who are rendering service indirectly, being forced by the illusory agent of the Lord, are rendering service unto Him unfavorably. But those who are rendering service unto Him directly under the direction of His beloved agent are rendering service unto Him favorably. Such favorable servitors are devotees of the Lord, and by the grace of the Lord they can enter into the mysterious region of transcendence by the mercy of the Lord." "Krishna's devotees relate to Krishna in various relationships; one might treat Krishna as a son, or one might treat Krishna as a husband, as a friend, or as a master." "Service to the Lord is rendered in different transcendental mellows (relationships): neutral, active, friendly, parental and nuptial. A living entity in the liberated position of transcendental service to the Lord becomes attracted to one of the above-mentioned mellows, and when one is engaged in transcendental loving service to the Lord, one's service attachment in the material world is automatically vanquished." If relationships with Krishna are so wonderful, why would anyone want to leave Him and come to the material world? What if I'm a guy? How can I have "amorous attachment" for Krishna? That doesn't seem right.